A concussion is a type of mild traumatic brain injury, often caused by a bump, blow or jolt to the head. You can also get a concussion from a whiplash-type injury that cause the brain to quickly shake inside the head (such as in a motor vehicle collision). Concussions are one of the most common types of brain injury, and often occur in children and teenagers as a result of playing contact sports. What happens to the brain during and after the concussion? Essentially, in a concussion, the impact to the head causes injury to the tissues of the brain. Often, this causes damage in the connections between rain cells, as well as to damage to brain cells and their death. The blow or jolt to the head causes a type of extension and compression of the brain, and this causes damage to small blood vessels, and some bleeding inside the brain can also occur. These types of tissue injuries inside the brain are often accompanied by inflammation. Are there any long-term effects on the brain after a concussion? Most people recover from the concussion completely, and their symptoms disappear. However, some individuals who sustained a concussion (up to 30-40%) may continue to experience long-term symptoms of a concussion. This is called post-concussion syndrome, and individuals who develop this syndrome continue to experience symptoms after six weeks following injury. 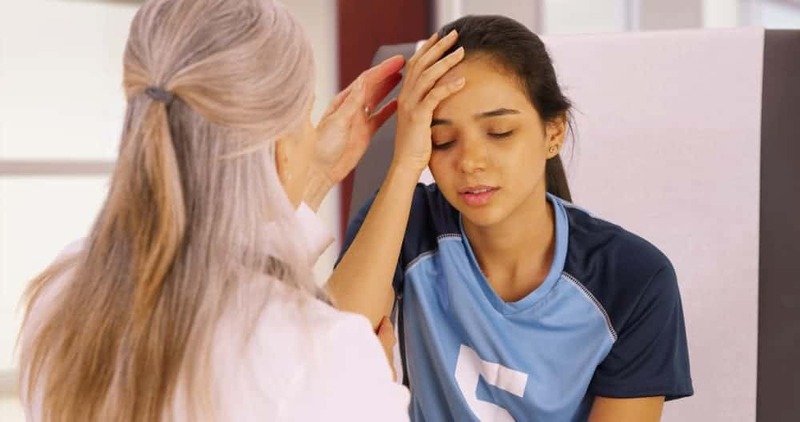 To make matters more complicated, it is often difficult to predict which patients with a concussion will recover completely, and which will continue to suffer from long-term symptoms. Medical researchers are still trying to identify the criteria which will help them identify individuals who are at risk of long-term effects after having a concussion. What are the long-term effects of a concussion? Some symptoms of a concussion can show up hours or days after the traumatic brain injury occurred. According to scientific research, individuals who had a concussion are more susceptible to getting another one, especially if the new injury occurs before symptoms from the previous concussion have completely gone away. This is why it is very important to wait until you are fully recovered before resuming team sports or any other athletic activity. Moreover, repeated concussions have been demonstrated to increase the risk of developing condition such as Parkinson’s disease and depression later on in life. Are children more vulnerable to the effects of concussions? The brains of children have much more neuroplasticity, the ability of the brain to change itself, than adult brains. However, according to researchers, children may be more vulnerable to the effects of concussions than adults. Children can develop complications if they return to sports or activities too soon after having a concussion. Moreover, children who return to school shortly after having a concussion may need some adjustment in the classroom, such as having a lighter course load and taking frequent breaks from activities that require concentration. What are the signs of concussion in children? Do concussions affect men and women differently? According to scientific research, women have a higher likelihood of having a higher number of symptoms and more severe symptoms after a brain injury than men. In addition, research shows that the rate of concussions is rising faster for women than for men. So, what is behind this gender difference in concussions? Scientists believe that female athletes are at higher risk of a concussion in the second half of the menstrual cycle, when there are more hormonal changes. In addition, some research also shows that neck-strength-to-head-size ratio of women may also play a role in making them more susceptible to concussions. How can concussions be prevented? There are many things you can do to prevent concussions. One of the best ways to prevent concussions is by wearing a helmet when playing contact sports or when doing activities such as skiing or biking. A large scientific study found that helmets provide a 63 to 88% reduction in the risk of head, brain and severe brain injury for all ages of bicyclists. Moreover, the study found that helmets can protect upper and mid facial areas from injury. Other measures you can take to prevent concussions is to wear seatbelts when driving, and use airbags. In adults, drinking alcohol is considered to be a risk factor for concussions, since it is often responsible for falls. Therefore, responsible alcohol consumption is a must in preventing concussions.